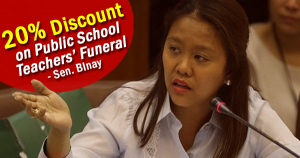 Public school teachers, who died due to work-related sickness and injuries, would receive “funeral discount privileges” if Senator Nancy Binay’s bill is enacted into law. “The amount of discounts granted in pursuance of this Act shall be allowed as deductions in the computation of taxable incomes of funeral homes granting the same, provided however, that the tax deductions shall not exceed 10 percent of its taxable income,” the bill said. “Provided, further that the tax deduction under these sections shall be evidenced by the Public School Teacher’s identification card used by the Department of Education and the Commission on Higher Education,” it added. Under the proposed measure, violators should be penalized by imprisonment of up to six years and/or a fine of up to P200,000. Binay hopes that these “special discounts” to the public school teachers would somehow ease their economic burden caused by their meager income. “Public School Teachers never ceases to uphold their responsibility in educating the youth despite being overworked with long hours and large class sizes. The State recognizes the efforts of Public School Teachers in shaping the youth towards becoming productive and responsible members of this country,” she said in her explanatory note in the bill.